Learn for yourself how clean the printheads TX25 at home, without having to visit a technician. If you are not getting the printing quality you need, it is necessary to clean the printheads, thanks to the good front end that this Epson printer has it is easy to do this operation, it can be done either from the front panel of the printer or from the printer properties in your PC. Next we will present two ways to do it, before doing the cleaning you have to check that no cartridge is about or completely running out of ink, to do so you will need a lot of ink in the cartridges and to be aware that this process will consume big part of it, do not perform this process frequently or you will run out of ink and will have to replace your cartridges many times. Follow the next steps, we will try to explain it as precise as possible, we will explain it from how to place the paper to how to clean the printheads either from the printer or from the printer program. How to place the paper in the TX25 Epson Stylus printer. To place the paper in your printer, you have to check that the doors giving access to the printing process are opened, including the doors where paper goes in and the one paper goes out, the paper orientation has to be right and check the printer is completely working without errors at that moment. Paper is really important is this process, since after finishing the printheads cleaning a test page will be printed. In this page you will see the cleaning results, it means you will see if the quality given by the printer after the cleaning is the quality you are looking for. When you already have the paper in your printer and everything is ready to start you will have to press the stop/reset button for about 3 seconds, the printheads cleaning will last no more than a minute. While the printer is doing the cleaning cycle the ON/OFF button will be flashing , when the printer ends the cleaning cycle it will light in green. When the process is finished, you have to check the injectors, in this case it can be done either in the printer front panel or in printer properties panel. 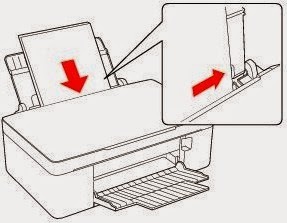 In case you need to do a printheads cleaning of the TX25 Epson Stylus printer from the its software using the program in the section of maintenance follow the instructions on how to clean the Epson printheads, in case this does not work it is recommended to do Epson printheads cleaning in depth.